Tony O'Brien -an appreciation, RIP Dec 2015. The Tony O'Brien Scholarship Fund, which ran from 2011 to 2016, was established by C&C plc to honour Piltown native Mr. Tony O'Brien and to recognise his substantial contribution to the industry and to the C&C organisation in particular. Tony O'Brien retired from C&C in 2010 having completed forty years with the group. He served nine years in finance roles including Finance Director. This was followed by twenty one years as CEO and a further nine years as Chairman. Under his leadership the organisation achieved exceptional success over this time. The Tony O'Brien Scholarship Fund has been used to finance scholarships in business-related programmes in the Quinn School of Business in UCD. 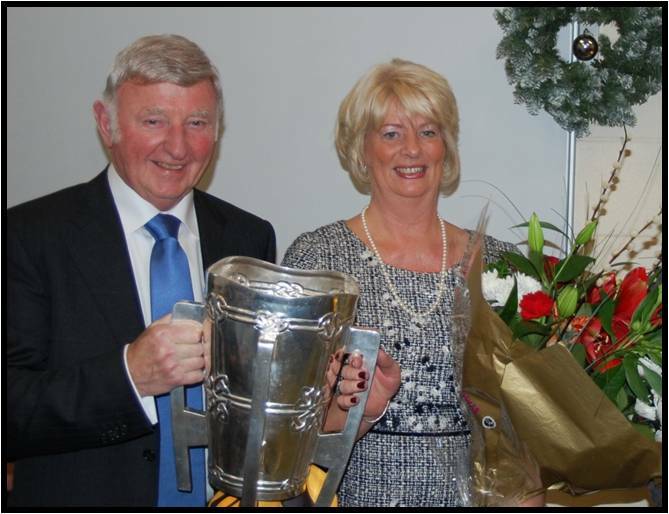 This was made possible through his generosity and philanthropy of which CBS Kilkenny is delighted to be the benefactor. Mr. O'Brien's decision to direct these funds to support suitably qualified students from CBS Kilkenny reflects his roots in his native county. He explained his choice of Kilkenny CBS as being due to the school’s long-standing contribution to the fabric of life in the city. He continued to say that CBS Kilkenny has a ‘wonderful balance’ across all aspects of school life and that this was a major factor in selecting CBS Kilkenny as the recipient of this scholarship scheme. Under Mr. O'Brien's direction the awarding of these scholarships in commercially relevant studies reflected his own success. His choice of UCD was due to the reputation of the University as Ireland's premier business college. The Quinn School is the only internationally accredited institution of its kind in Ireland. Each June from 2011 to 2016, students who possessed the necessary aptitude to complete degree courses in commerce/economics/business studies were interviewed by members of an independent selection committee. Over the course of the scholarship, ten students benefited from full funding for their undergraduate studies. Some of their stories are below. Check in later for further updates. We are very grateful to Tony (RIP) and Frances O'Brien for their generous and unstinting support of our school. 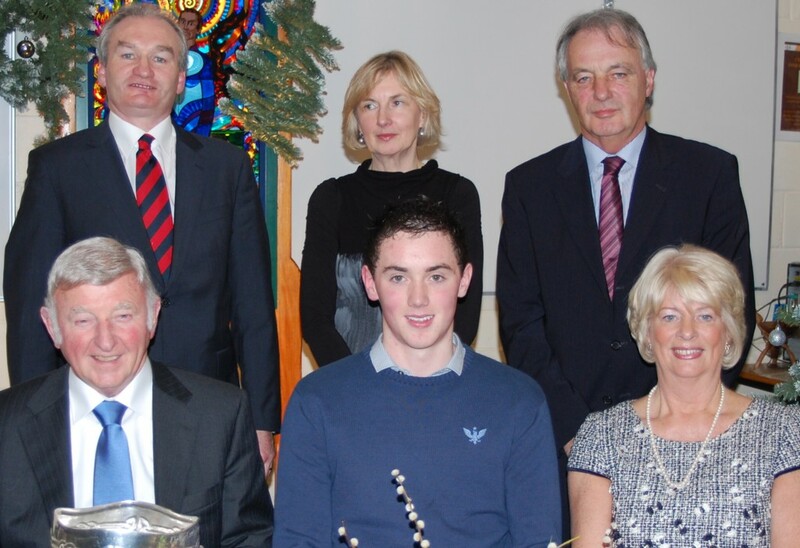 The 2011 winner was John Brennan, and we warmly congratulate John and wish him well in his future pursuits. 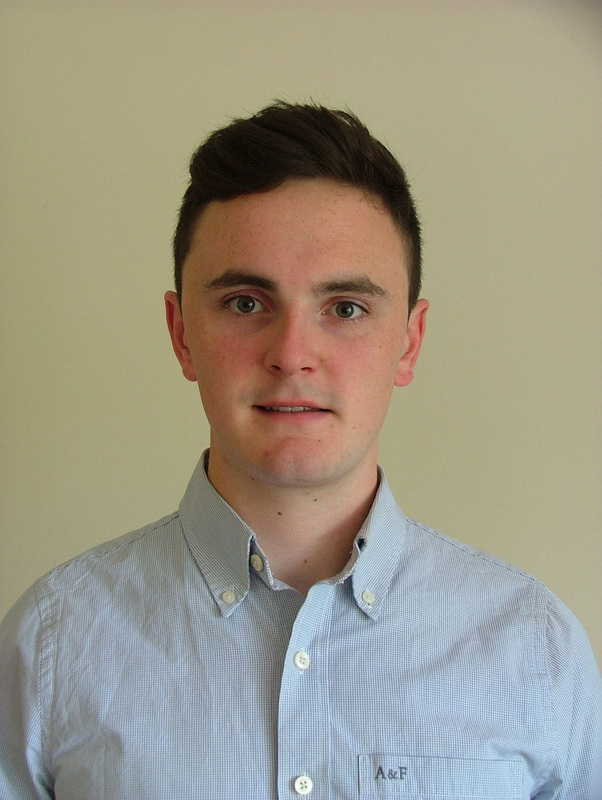 John Brennan completed his secondary education in Kilkenny CBS in June 2011 and is currently pursuing a Business and French degree in UCD. 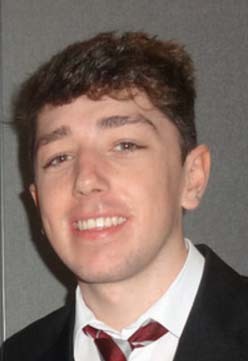 John was at all times in his six years at CBS a diligent, hardworking student who took a keen interest in sport. The unassuming Barrow Rangers clubman particularly enjoys hurling. On receiving his award, John returned to his alma mater in the company of his proud parents Paddy and Margaret and spoke at length to a large gathering of 6th Year students, about his experience thus far in UCD. He expressed his gratitude to all in the CBS and thanked Tony and Frances O’Brien for making the opportunity available to him through the scholarship. ​As a gesture to Tony who is an avid Kilkenny Hurling supporter, CBS PE Teacher, former pupil and All-Ireland medal winner Matt Ruth presented him with an autographed Kilkenny jersey in the presence of the Liam McCarthy Cup. Principal Tom Clarke, together with the whole school community express their sincere gratitude to Tony and Frances O’Brien and also to wish John Brennan every success in his academic pursuits. I was successful in my application to complete a Masters of Accounting in the Michael Smurfit School of Business on the Blackrock Campus in Dublin. This was a 11-month programme which began in September 2015. The course proved to be both challenging and interesting, providing me with a further insight into the various different disciplines of accountancy. I successfully graduated from this Masters programme in December 2015, receiving a first class honours degree. In September 2015, I started working with KPMG in the Financial Services Tax department located in the IFSC in Dublin, with a focus on Irish corporate tax and international tax advice for companies in the global aviation finance, insurance and banking sectors. Over the duration of the contract, I will complete two sets of professional exams in the areas of accountancy and taxation – ACA and AITI respectively. I successfully completed the second set of AITI exams in April 2016. I am sitting the Final Admitting Exam of the ACA exams this August and all going well, I will also sit the final set of the AITI exams next May 2018. I enjoy working with KPMG and plan to stay with the firm for the foreseeable future. As mentioned, I will hopefully succeed in the final set of ACA and AITI exams over the coming year, after which I will be a qualified Chartered Accountant and AITI Tax Consultant. I would once again like to take this opportunity to express my sincere gratitude to Tony and Frances O’Brien for the extremely generous opportunity they provided me with six years ago. I would also like to again thank the teaching staff for all the resources and guidance I received over my time at CBS Kilkenny. Having just finished my Commerce degree in UCD, it’s hard to believe that three whole years have passed since I began to sit my leaving cert exams! It’s very hard to know when you are still a humble fifth or sixth year student, what career path you would like to pursue. I was one of these students for a long time. However, I can honestly say that Commerce proved to be the right choice for me. I have immensely enjoyed my time studying at the UCD Quinn School of Business. Just last week, I received my results and to my delight, I have come out with a first class honours in my final year of the Commerce programme. To be more specific about the course itself, Commerce is a great choice for any student who has an interest in the business world, but is unsure of the specific area he/she would like to go into. For first and second year, your modules are laid out for you and you gain an insight a multitude of different areas of business such as Human Resource Management, Marketing, Analytics, Management, Economics, Accounting and Finance. Once you come to third year, you will have developed a personal interest in one or maybe several of these areas and you are then given the opportunity to specialise in your preferred area. I myself opted to major in Accounting in final year and minor in Taxation. Throughout these three years, an abundance of academic resources are laid before you, from some of the top lecturers in the country, to helpful and friendly tutors who give you an extra hand in small group sessions, as well as supplementary online resources. The Quinn School itself is among the most modern and well finished buildings in UCD also. Over the course of my own Commerce degree, I always had a keen interest in the accounting discipline. It just seemed to click with me. For this reason, I took it upon myself to take apply for an internship in the summer of second year, 2013, with KPMG, in order to gain an on-hand insight into the accounting profession. This was a twelve week internship in the FS Tax department of their IFSC offices in Dublin. For me this was all invaluable experience. I had prior knowledge in the area of accounting but I was never exposed to taxation. During my time at KPMG I developed a keen interest in the area of tax and felt that I would like to pursue it as a career path once I finish college. This is the reason as to why I decided to Major in Accounting and Minor in taxation in my final year. This internship was without a doubt one of the most beneficial things I have done over my three years in Dublin, and I would recommend anyone with a possible interest in this area to pursue a similar summer programme. Worst case scenario you’ll decide that you hate accounting, but at least then you can cross it off of your possible career paths! So I suppose now that I have officially finished my Commerce degree, the big question is where do I go from here? After my summer internship with KPMG, I was fortunate enough to have been offered a contract to complete a sponsored Masters of Accounting in the Michael Smurfit School of Business, and then go back into the FS Tax department of KPMG on a full time basis. I received sufficient results in my finals to enter the Masters programme, so come September I will be entering the twelve month programme on the Blackrock campus. The progress I have made over the past three years would never have been possible if it weren’t for the excellent education I received in CBS over my six years there. I would like to take this opportunity to thank all the teaching staff I encountered over my time at school. To finish, it is hard to put into words the gratitude and respect I have for Mr Tony O’Brien. Due to his generosity and selflessness, I will soon receive my Bachelor of Commerce Certificate. All I can offer is the most genuine thank you. I will always be beyond grateful. Warmest congratulations to our two scholarship winners from the 2012 Leaving Certificate class. Ian Boland and Mihai Focsa both qualified for the scholarship and are pursuing business courses in the Quinn School of Business in UCD. The very generous nature of the award will significantly ease their way through the next four years. Both students performed very well in their Leaving Certificate examination and this scholarship is hard-earned and well-deserved. We are very proud of them and wish them both good luck in their future studies. 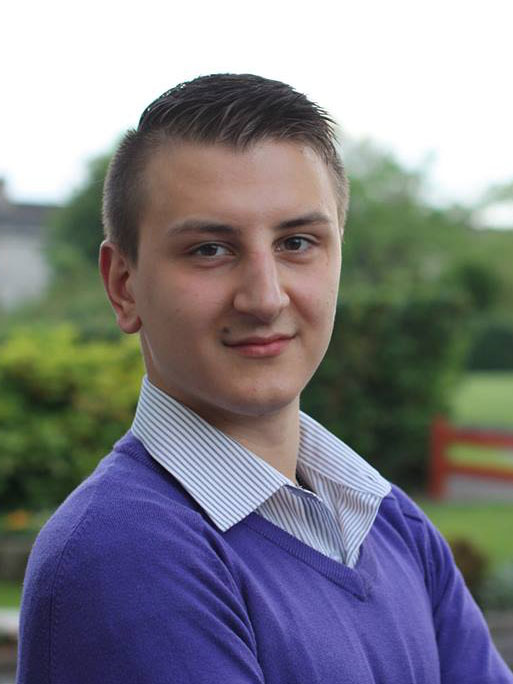 My name is Mihai Focsa and I am fortunate to be a Tony O’Brien Scholarship recipient for 2012. I have recently completed my second year of Business and Law in the UCD Quinn School of Business. I was a Residential Assistant for UCD Residences during the previous academic year, and I am currently a Room Auditor and a RA for the duration of the summer. I graduated CBS Kilkenny in 2012 having achieved full honours in my leaving certificate, an accomplishment made possible by the learning atmosphere and the teaching environment in the CBS. During my final year in the CBS, I undertook the subject of Business outside the school setting as an extra subject. The only assistance I received was from the teaching staff outside of classroom hours, out of their generosity and dedication to me as a CBS student. I feel that this is a testament to the teaching philosophy in CBS Kilkenny. The emphasis on extra-curricular activities fostered in the CBS has stuck with me, having held the position of Treasurer for the UCD Judo Club for the year 2013/2014. My six years in the school have been a fantastic experience, allowing me to achieve my full potential and develop into the young man I am today. I would like to thank Mr. Tony O’Brien, C&C plc. and CBS Kilkenny for facilitating and helping me achieve my ambition to pursue my interest of Business and Law in University College Dublin. My life has been changed due to this endless generosity, and for that I will always be grateful. I have come to the end of my time in UCD in recent weeks and that brings to a close a chapter in my life which has seen me flourish from being a young naïve 18 year old boy to now a somewhat less naïve 23 year old man. I loved my time in UCD. I met so many amazing and wonderful people along the way. Business and Law was by no means an easy course, but was one which provided me with an excellent all round base, and is a degree which opens so many doors for the future. Every one of my colleagues have different plans. Some want to be barristers, some solicitors, others accountants, several aspiring digital and social marketers, the opportunities are endless. Over the next year I intend to sit the FE1 examinations, which are the entrance exams into Blackhall Place. This is where one goes if they intend to qualify as a solicitor and this process takes 2.5 to 3 years. So I am by no means the finished article and have a long road ahead of me, but look forward to the challenge with a youthful enthusiasm and a determination to succeed and excel, qualities which have been instilled in me since my early days in the C.B.S. I am in the fortunate position to have been offered a training contract with one of the leading law firms in the country which I will commence upon completion of my FE1s. If it were not for the wonderful generosity and philanthropy of Mr Tony O’Brien, coupled with the excellent education I received in C.B.S, I would not be where I am today and I will be forever grateful for the opportunities which I have been given. I would like to take this opportunity to thank everyone who has contributed to my success, Tony and Frances O’Brien, Tom Clarke and Dermot Curran and all those who taught me during my time in C.B.S. Business and Law is a great course!! Put simply, it is a mixture of a commerce degree and a law degree. On the commerce side of things I have studied subjects such as Financial Accounting, Business Analytics, Business in Society and ICT in Business. On the law side of things I have studied subjects such as Contract Law, Criminal Law, Constitutional Law and EU Economic Law. My commerce modules all take place in the Quinn School of Business which is one of the more modern buildings on campus and has great facilities for studying and relaxing between lectures. For my law modules I have the wonderful opportunity to study in the brand new Sutherland School of Law, UCD’s newest building. It is a fabulous building and has great facilities. In UCD I am lectured by some of the most intelligent and learned people in the country. For example two of my law lecturers, Paul-Anthony and James McDermott, are possibly the two best barristers in the country. The two brothers teach a lot of the law modules in Sutherland. Paul-Anthony was one of the leading prosecution lawyers in the recent case of the infamous Anglo Irish Bank. College at the start seemed a very daunting prospect. I remember moving in to my campus accommodation in first year worrying about absolutely everything. I was lucky to have a lot of my school friends in UCD too so that helped immensely. Ever since then I have not looked back. I have made so many new friends from all parts of the country and even though my course has been tough at times I have gotten through it and am looking forward to starting my third year in September. UCD is a great place to study and my advice to anyone thinking of studying there after the Leaving Cert would be to take every opportunity that comes their way, not have any fear about moving away from home, have an open mind with regard to meeting new people and making new friends and most importantly enjoy yourself and have a good work life balance. The last two years have honestly been the best of my life so far and I am eternally grateful for the opportunity afforded to me by Mr Tony O’Brien and the CBS. 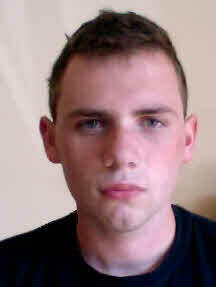 Many congratulations to our 2013 successful applicant. 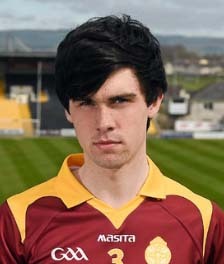 Ciarán Denieffe. 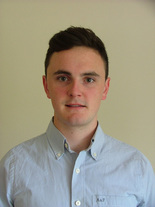 Ciaran commenced in the Quinn School of Business in September 2013 and will complete a four year degree course there. We are very proud of his achievement and wish him every success with his studies and future career. I have just completed my final semester in UCD, and it is hard to believe that four years have passed since I was in CBS Kilkenny sitting my Leaving Certificate. I have spent the past four years studying Business and Law in UCD and I have absolutely loved my time there. I have had four fantastic years in which I have made many new friends and had new experiences. I can say with absolute certainty that choosing to study Business and Law was the right choice for me. The course I chose to study has been broad and it has given me knowledge in a number of diverse areas. Many of the modules I completed have been very interesting. I love the mix inherent in Business and Law which means you are not limited to one subject area. When entering final year, I was able to choose the subjects that most interested me. Many of my modules in my final year, were accounting/tax related as this is an area that I hope to pursue in the future. I have been fortunate enough to learn from experts in these fields. Learning occurs not only in lectures but also in smaller tutorials that take the form of group sessions. In these tutorials, groups are small, and tutors are there to provide help. This really ensures that you acquire a thorough understanding of the material and have any questions answered. The learning environment really has been so supportive and you always feel that help is at hand. Now that I have completed my degree, I have been lucky enough to obtain a job offer from a major financial services firm with whom I completed an internship last summer. I have deferred this offer until September of 2018, as I am planning on spending the next year travelling before returning to Dublin to enter the world of work. I would like to take this opportunity to thank all of the staff at the CBS Kilkenny. Were it not for the first class education I received from the CBS I would not have achieved what I have. I am very appreciative of the opportunities that I have been given as a result of receiving the “Tony O’Brien Scholarship”. I would like to express my sincere gratitude to the O’Brien family and C&C plc. Due to their generosity, I have been provided with an excellent 3rd level education and I have had four fantastic years in UCD. It is difficult to express how grateful I am and always will be. 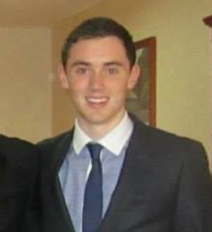 I am currently studying for a degree in Business and Law in UCD. This course combines law and business into a single degree, providing great career flexibility as students gain equal experience in both disciplines and are free to pursue a career in either area upon graduation. In the first three years of the degree, business and law are studied equally. However in fourth year, students specialise in areas of particular interest to them. In first year I have studied business subjects such as Micro-Economics, the role of ICT in modern business, Business Mathematics and the relationship between business and society. I have also studied the fundamentals of Law, for example Contract Formation, the Drafting of Legislation, Constitutional Law etc. I have enjoyed the broad range of subjects that I studied in first year. My lectures have been both informative and interesting. While the course is challenging, it has been great to see how information we learn can be applied to real world situations. Continuous assessment and group work were an integral part of most of my modules. This was a big change from secondary school but working as a member of a team develops interpersonal skills that are necessary in the modern workplace. UCD, as Ireland’s largest university, has a student population that equals Kilkenny City, but the excellent peer mentoring programme run by the college every September, means that it was easy to get to know other students on my course. Living on campus also made it easier to settle in and meet fellow first year students. On campus facilities are second to none and range from a cinema to a state of the art leisure centre. There is also a diverse range of societies and sports clubs in UCD. I thoroughly enjoyed my first year experience and while the Summer is only just beginning, I am already eagerly awaiting my return in September. I was honoured to be awarded the Tony O’Brien scholarship. I am deeply grateful to Mr. Tony O’Brien and C&C plc. for their generosity and to CBS Kilkenny for facilitating the scholarship. At the end of May I completed the third year of my Commerce degree in U.C.D. I have spent the academic year working in PwC as part of their assurance section. This internship is optional for Commerce students and for this reason several of my classmates have recently completed their final undergraduate exams. I am very glad that I chose to apply for this opportunity as the year spent working reaffirmed my interest in accountancy. I will now return to the Quinn School of Business in September with a more detailed knowledge of the business world along with a good idea of what the process of auditing a business entails. During my future studies I hope that I will be able to link the theory of accounting in the classroom to the practicalities of the tasks completed during my placement. Choosing to major in Accounting during final year will provide a full set of CAP 1 exemptions meaning I will only have to sit another two sets of exams after college before becoming a fully qualified chartered accountant. Having spent three years in college I am now fully comfortable in my surroundings within U.C.D. During my first year away from home I found the importance of joining the G.A.A. club gave myself the chance to make friends immediately. I would encourage any current sixth year who will be going to college for the first time this September to engage in some form of hobby throughout third level. The friendships that will be made will last long beyond the end of your degree. U.C.D. is a college which I would recommend to any prospective student. It provides tutors and lecturers of the highest quality who are warm and willing to go the extra mile to help students through exams. Though college will appear daunting at the beginning, the Quinn School is definitely an environment where any new student will quickly begin to feel comfortable. ​​Now that I have completed my final year in the Commerce Programme at the Lochlann Quinn School of Business at UCD, I have had the time to look back on the past three years and I am glad to say that Commerce was the correct choice for me coming out of secondary school. I would certainly recommend it to all present and future CAO applicants. I have thoroughly enjoyed my time attending UCD and studying at the Quinn School. Being in possession of a Bachelor Degree in Commerce from UCD is certainly a proud achievement for me and I know it will prove to be an advantage to me in my future career. I, like many other Leaving Certificate students, was unsure of what course to choose leaving school. Before beginning the Commerce programme, I felt selecting it was a bit of a risk due to my lack of business subjects throughout secondary school, but at all times throughout my college experience, I felt I was on an equal footing to the rest of my classmates despite them having previously done business subjects. Within the first year, you are given a broad introduction to the different facets of the business environment, taking classes in areas ranging from economics and accounting to marketing and business ethics. Beginning second year you begin to specialise to a specific business subject area to a small extent and finally in the third year you fully choose to major in a definitive field of business.. I took a liking to the modules with a noticeable foundation in mathematics and current affairs, which were primarily economics and finance. Upon reaching final year, I had advanced to a stage of taking a majority of finance classes, which involved studying investment strategies and portfolios, the bond and stock markets and the currency exchange environment. At the Quinn School, I was lucky to have access to Bloomberg terminals that facilitated my learning in this subject area, access I feel I would not have received elsewhere. Living in Dublin and especially around the south Dublin area was a pleasant coexistence for the past three years. Being a Tony O’Brien scholarship recipient certainly made my college life a lot easier as I was able to afford on-campus accommodation in my first year and was later available to rent a flat outside of campus but within a short distance. This greatly reduced the majority of the accommodation search stress on my family and I that many students and their families do face when attending college throughout Ireland. The UCD campus contains all the latest facilities with a state of the art gym and sport areas, must of which is free to access as a UCD student. There are also many sports teams and societies to join, I for example played for soccer recreational as part of a Sunday League team and also played American Football competitively on the UCD American Football team. At this particular moment in time, I have yet to obtain my final grades so the future is still yet to take shape. I am currently in the process of applying for graduate jobs and graduate internships, focusing on jobs in the currency exchange markets. Upon reflecting on my time in UCD, I firmly believe that the fine education I was exposed to at CBS Kilkenny enabled me to be successful to the extent that I have been at UCD. This education is only possible due to the great teaching staff at the CBS and I wish to thank Mr Tom Clarke and the rest of the staff for all of their help and support during my years in school and since then. I’m incredibly lucky to be the last recipient of the Tony O’Brien Scholarship. It’s hard to believe that this time last year I was enjoying my last few days in CBS and time has flown ever since. Like many recipients before me, I’m studying Business and Law. The nature of my course means that my modules are split between the two. I really enjoy this as it means greater variety in subjects and keeps things interesting. I would definitely recommend it to anyone interested in business, because you learn about contract formation and how legal systems in different countires can affect the way business is conducted. My interests from school have continued on into my involvement in many of UCD societies. In the CBS I took a keen interest in Irish, and was chosen for the both the Tráth na gCeist and Gael Linn debating teams. I’ve been recently appointed the treasurer of the Cumann Gaelach in UCD, which aims to promote the use of Gaeilge on campus. Last year I was a member of the CBS Concern debating team which reached the national semi final and I made sure to pursue debating further by joining the Law Society of the university. I now serve as their Public Relations Officer, a position I previously held with the Student Council. Societies are a great way to meet new people, share interests and get involved in campus life; especially if sport isn’t your forté! 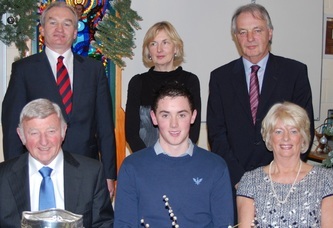 Earlier in the year Mrs O’Brien, staff from both UCD and CBS, management of C&C and past recipients of the scholarship came together for a meal to celebrate Tony O’Brien and his legacy. It was a great occasion to share memories both of the school and of Tony’s life. It served as a reminder to me of the great experience I had in CBS and the amazing opportunity Mr O’Brien gave to me.